As an IT or purchasing manager you need to keep your IT procurement costs low and at the same time give in-house users the modern tools they need to deliver great results. And these are just two of the many considerations you have to juggle amid the challenges of an increasingly digital process chain. That’s where we come in. Bechtle helps you take your procurement process to the next level, end to end, and create true value for your organisation as you re-align your focus to the challenges of a business-oriented IT or sourcing strategy. bios® is a highly customised e-procurement system that you can access with your personal bechtle.com account. Your own bios® shop is tailored to your specific needs and designed to save time and money, streamline and accelerate procurement processes, and leverage framework agreements across your organisation. And the numbers speak for themselves: More than half of Bechtle’s customers across Europe have been able to dramatically cut their process costs for sourcing IT products and services by making bios® an integral part of their procurement. With a choice of over 70,000 products from more than 300 manufacturers available online, we give you the whole world of current IT at your fingertips. Your own bios® shop gives authorised employees access to a pre-approved selection of products that meet your organisation’s specific needs, all available at up-to-date prices. Purchasers benefit from convenient e-invoicing and e-signatures, while transparent statistics and custom reports give you complete visibility into all procurement activities. Granular user management, shipping and invoice address management, multi-tier authorisation flows, and many other purpose-built procurement features help you achieve and streamline a paperless procurement process throughout Europe. 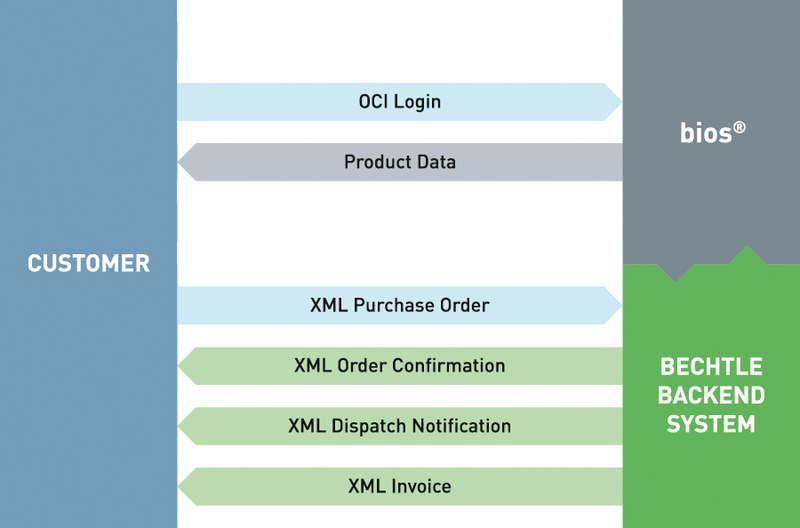 Industry-standard APIs mean bios® can integrate with your ERP system for a lightning fast exchange of quotes, orders, invoices and other data to further expedite your in-house processes. Want to know more about bios®? Simply e-mail us at sales.direct-nl@bechtle.com or call us on (+31) (0)40 250 9040. We’re happy to help. 1. Integration with ERP systems. Bechtle first launched its e-commerce and e-procurement business in 1995, and in 1999 was among the first companies in Germany to be SAP-certified for integrating procurement applications using SAP’s PunchOut interface, OCI (Open Catalog Interface). Today, the majority of our customers tap into our e-procurement solutions, with many connecting via industry-standard catalogue interfaces. The Open Catalog Interface (OCI) is a standard access point to transfer current catalogue data between ERP systems such as SAP EBP/SRM and supplier systems using common internet protocols. It was originally developed by SAP to facilitate procurement from third-party web catalogues directly within its ERP environment. This allows users to browse rich online catalogues such as Bechtle’s B2B platform to research products and eventually place an order within the customer’s SAP or other ERP or marketplace system in compliance with the customer’s procurement policies. The process of a customer system accessing an online catalogue is often referred to as “PunchOut”. Scenario connection with OCI interface. 2. Integration with marketplaces/business networks. B2B relationships in the age of marketplaces and consumerisation. Marketplaces make it easy for customers to quickly integrate new suppliers into their procurement environment. At the same time, the number of suppliers they deal with has been significantly condensed. As a consequence—and against the backdrop of other, more complex projects—their focus has shifted from reducing suppliers to a lean and unified integration of suppliers. What matters is not so much the number of suppliers, but the number of processes. Consumerisation has blurred the line between B2B and B2C customers. Users across the board have come to expect a fast, intuitive, comfortable and flexible experience. A procurement solution and process must align to this reality, top to bottom. Innovative, digital business processes developed by suppliers are set to challenge the notion that digital sourcing essentially only refers to how documents are exchanged between the customer and supplier. While this is still a prevalent belief in many organisations, analogue legacy processes that connect to a modern digital platform can indeed compromise the true value of the solution. Bechtle has been active on many leading marketplaces and business networks for decades. Depending on the technical standards supported by the respective platforms, we can provide catalogue data both in the form of static snapshots as well as via dynamic PunchOut connections complete with 100% paperless document streams. Hosted catalogues are regularly synced to the customer system, giving purchasers a static snapshot of the Bechtle catalogue at the time of synchronisation. Catalogue data includes product information such as names, descriptions and prices, which are accessible to purchasers and other customer stakeholders within their own procurement solution. Catalogue data can be transferred using one of several common formats such as BMEcat, JSON or SAP Ariba’s CIF. 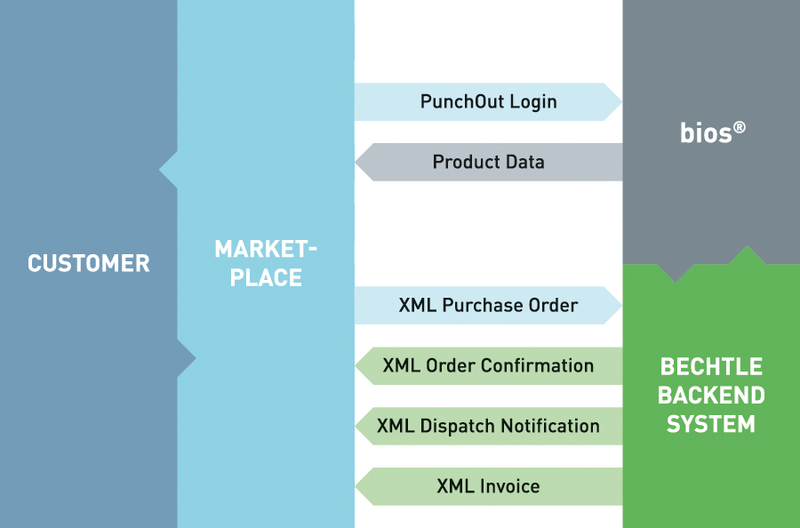 2.2 Punch Out catalogues – Integration level 1. Users can “punch out” of their own procurement system and connect to their exclusive bios® account via OCI or SAP Ariba’s proprietary cXML format. Communication between bios® and the customer system is bidirectional, enabling granular control of customer-specific portfolios and purchasing conditions. 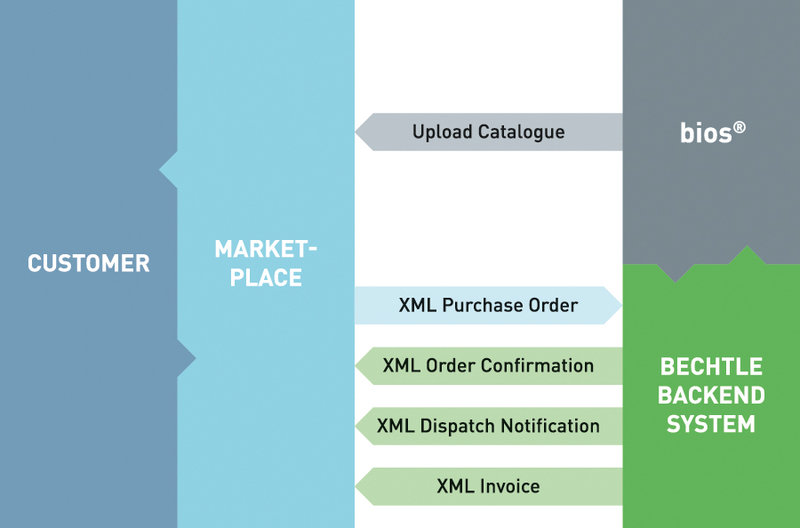 Users can browse the connected catalogue within the Bechtle environment and add items to their shopping basket, which is then synced back to the customer’s procurement system where they place the order subject to their own procurement protocol. This may include accounting, approval or any other customer-specific steps. 2.2.1 Scenario Punch Out level 1. 2.3 Punch Out catalogues – Integration level 2. The second level of PunchOut integration allows users to browse items directly within their own environment without the need to switch to an external website. This enables unified access to both static (i.e. downloaded) and external catalogues through a single procurement solution. However, users still have to punch out in order to add external catalogue items to the shopping basket. 2.3.1 Scenario Punch Out level 2. 3. Product and service classification systems. There are a number of classification systems that have been designed to catalogue products and services in ERP systems and marketplaces, covering over 50,000 product classes. This enables businesses to exchange product data across industries, countries, languages and organisations using shared and unambiguous terminology. 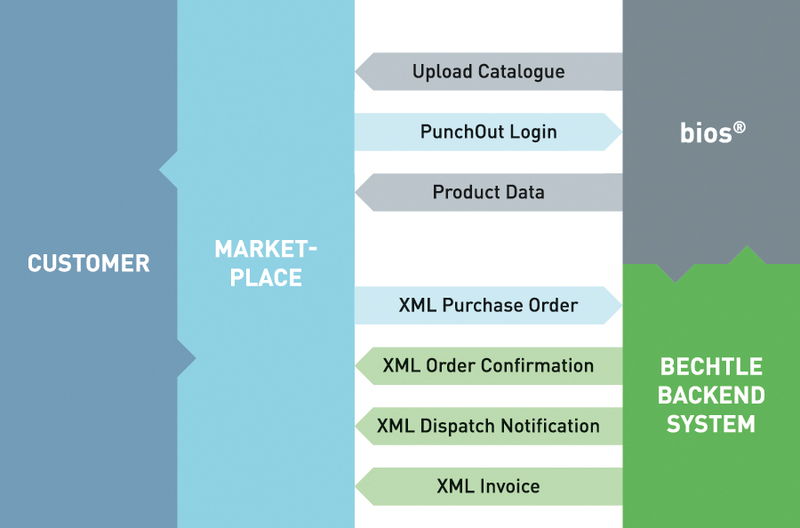 Ideally, an order that is generated in the customer system or marketplace is sent to the Bechtle B2B gateway via an XML gateway such as SAP XI/PI/PO or another EDI platform. Alternatively, orders may be transferred as e-mail attachments. Incoming data are verified and preprocessed in accordance with customer-specific parameters as they pass through the Bechtle gateway before they enter Bechtle’s ERP system. They are then passed on to the Bechtle branch managing the account, which will, after a final automated due diligence check, process and fulfil the order. We are also able to accept EDIFACT D96A / D97A standard orders. However, this may add significantly to the project scale. We recommend a secure transfer of order data to a web server via HTTPS POST. Bechtle also supports (S)FTP and AS2, as well as unencrypted transfers via HTTP or e-mail attachments. However, HTTP and e-mail are not encouraged and are exclusive to specific scenarios where unsecured transfers may be necessary. The ZUGFeRD 1.0 (2014) standard enables structured invoicing and credit data to be provided in and extracted from a modified PDF file. The format is a joint development of stakeholders in the automotive, banking and software industries, as well as the public sector to address the need for a standardisation of invoice transactions across national borders. Unsigned XML invoices are always accompanied by a hardcopy. Signed XML invoices via a certified signature provider. For a completely paperless workflow, it is necessary to have XML invoices signed by a certified signature provider to guarantee compliance with legal provisions, and maintain an audit-proof long-term archive of all invoice data including any relevant certificates. ► It is generally advisable to postpone the integration of electronic invoices until all aspects of the basic OCI/XML integration of purchase orders are confirmed to run smoothly in a live environment. We also advise that both parties must adhere to strict legal requirements governing electronic invoices. For a deeper insight into the technical integration of bios® into external procurement systems, please use our documentation.